A guide to setting up, deploying and managing Microsoft Internet Information Server 5.0 for the non-technical staff. The growth of the Internet has been equally impressive. It is difficult these days to find a business without .com behind its name. Universities have .edu and local school district proudly displays its state and country, mydistrict.k12.az.us. School communication has also grown. Parents, and the communities which schools serve, desire more and more information. The Internet provides the medium to disseminate this information. Microsoft provides the perfect tool for placing this information on the Internet in the form of Microsoft Windows 2000 Server combined with Internet Information Server 5.0. While schools and school districts continue to design or expand their computer networks, society continues to demand information. Unfortunately, many school districts use 100% of their resources to keep their networks functioning. Adding to these problems is the public sector’s demand for experienced network administrators and technicians. It is difficult for school districts to compete with the salaries offered by corporate America. This document is designed for the staff member who is charged with the task of setting up and managing a Microsoft Internet Information Server and has not had the opportunity to become an expert in the intricacies of this powerful tool. I want to take a moment to thank the people have taken time out of their life to help me with this project. To my wife and daughter Jenifer and Victoria who never complained as I spent countless hours with my face glued to a computer monitor. To Ladd Bausch a great friend and mentor who not only edited and advised me throughout this writing. He also spent the past four years helping me hone my skills as a technical writer. To Logan Bausch who beta tested and provided feedback. To Peoria Unified School District, which has employed me for the past 8 years and allowed me the opportunity to gain the knowledge, I pass on through this book. To my Mom and Dad whose countless sacrifices enabled me to complete my education. The World Wide Web and Your School District is designed to be a two-phase tutorial and guide with the non-technical staff member in mind. Each chapter is laid out with step-by-step procedures guiding you through the process of setting up a Windows 2000 web server for your school district. Upon completion of this guide, you will have a functioning web server which host separate and secure web sites for each school in your district. Additionally, your server will be able host a separate and secure web site for each teacher in your district. For the first time Web Server administrator, Microsoft Internet Information Server (IIS) can be intimidating. Therefore, I recommend you follow the procedures laid out in this book one time as a learning experience. To help with troubleshooting, I also recommend using the same schools and user names used in this guide. After you have successfully completed your “practice build” of the web server, complete the process a second time using your district’s school names. To aid you in the process of building your production web server, I have included a Web Server Procedure Checklist. Please review this checklist and obtain the required information from your network administrator prior to building your web server. Each chapter will contain an overview of the task you will be completing. Please take the time to review this information prior to beginning the chapter. And finally, I have included two sample databases along with the Active Server Page (ASP) scripts. These are the same databases I developed and use at my school district. Take a deep breath… Now go to it! The World Wide Web and Your School District contains a number of screen captures to assist you with the installation and configuration of Windows 2000 Server and Internet Information Server 5.0. Information pertaining to the screen capture will be posted directly above the image. To minimize confusion, different fonts or font styles will be used to distinguish different areas of the window. The title of this window Create Partition Wizard will be displayed in Bold. The name of this window Format Partition will be displayed with Bold Italic. Any radio button, check box or text field will be displayed in Italic. Any text you are to type in a text field will be displayed in Courier 10. Additional information may be displayed in the left margin. Below is an example from the document. NTFS partitions are not readable by windows 95, 98 or Me machines if the machine is booted with a Dos disk. 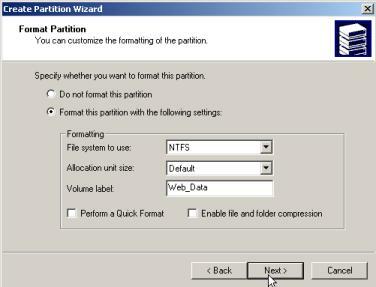 Create Partition Wizard / Format Partition window. Select the radio button to the left of Format this partition with the following settings. To fully utilize Windows 2000 security, this logical partition should be formatted using NTFS file system. Leave the Allocation unit size set to the default setting. Type Web_Data in the Volume Label field. Click Next. This information has been obtained from the Microsoft Web Site. The specific needs of your school district will determine the type of server needed. For example: The number of virtual web sites, the number of daily hits to your web server, the number of concurrent hits to your web server. Below you will see Microsoft’s minimum recommendations for server running Windows 2000. 133 MHz or higher Pentium-compatible CPU. 256 megabytes (MB) of RAM recommended minimum [128 MB minimum supported; 4 gigabytes (GB) maximum]. Windows 2000 Server supports up to four CPUs on one machine. 133 MHz or higher Pentium-compatible CPU. 256 MB of RAM recommended minimum (128 MB minimum supported; 8 GB maximum). Windows 2000 Advanced Server supports up to eight CPUs on one machine. The above will work wonderfully for a test server. However, on your production server I would recommend the following as a minimum standard. Pentium II 500 with 256 megabytes of RAM and 12 gigabytes of hard drive space. If your budget allows for a faster machine, consider upgrading to dual processors and upgrade your RAM to 512 megabytes. Additionally, you will want to include a RAID hard drive Array of and redundant power supplies. Last but not least, install a backup tape drive. I will not recommend a specific brand of server. However, I will recommend purchasing from a major computer manufacturer. Your web server is not the place to save a few dollars. One of the most important features in IIS is the ability to host multiple web sites on one machine. Prior to IIS 4.0, each web site required a separate web server. Using IIS, one web server is capable of hosting multiple web sites. Imagine the expense your school district would incure trying to give each school a separate web site before IIS. See the images below. Using IIS, multiple web sites may be placed on one server using multiple IP addresses. These IP addresses are assigned to the servers Network Interface Card (NIC) through a process called Binding. Using the same scenario as above, three machines have been eliminated. In some scenarios, multiple IP addresses are not available. In this case, IIS can host multiple web sites by using a single IP addresses while taking advantage of Host Headers. Again, three servers have been eliminated. Using Host Headers will require your webmasters use a Microsoft Web-Publishing product to create and maintain their web sites. Personally, I prefer separate IP address for each web site on the web server. Doing this also allows each site you have it’s own FTP site or FTP access for updating the web content. Microsoft recommends not having more than five IP address bound to any NIC and corresponding web site. I believe this recommendation was designed with web sites that take over 100,000 hits per day in mind. It is not likely a school district site will take 100,000 hits per day. At my school district, we have been successfully running 42 web sites with corresponding IP addresses assigned to one NIC for over three years. You will find it beneficial to gather the following information and items before your installation of Windows 2000. Use this document as a checklist to be sure you have accomplished each task in each chapter. Additionally you will want to keep this document in your records. q __________________________ The name you will type for owner of the server.